Sometimes I get an inexplicable crafty urge. And it’s never at a good time. I’ve tiled my basement floor during maternity leave and painted a bedroom with my kid running around in diapers (wouldn’t want the paint to get on his clothes!). I once ran over to Michael’s just before closing time to buy supplies for a mosaic mirror and then stayed up too late completing the whole project. And I have a wall hanging in the dining room that I painted the week I returned to work from my last maternity leave. Once I have an idea for a project, I can’t stop myself. So today when my husband came home to find the kids hungry, the house a mess and the baby crying, it should have come as no surprise. I was busy making a picture frame out of a vintage window I found down the block. 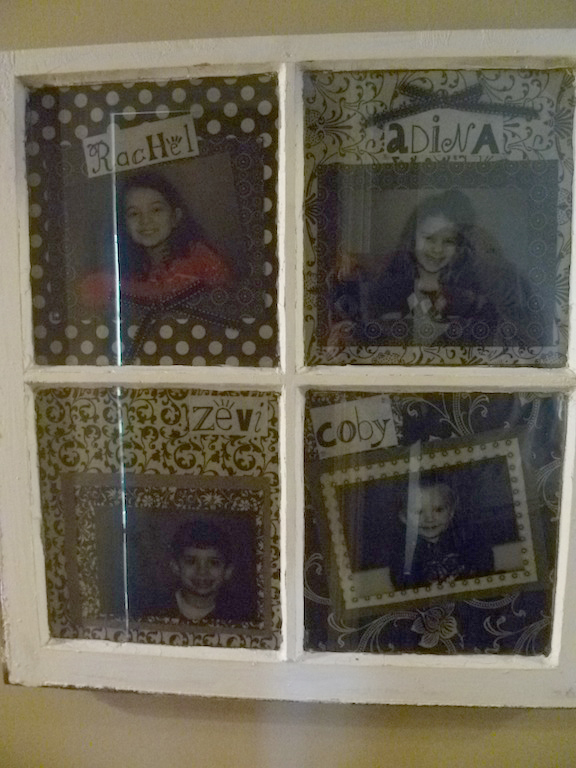 I filled each frame with a black and white photo of each kid, mounted on black and white patterns of scrapbooking paper. It was simple and cost next to nothing. My husband is lucky I don’t get the crafty urge too often. And I’m lucky that he hangs up all my projects.